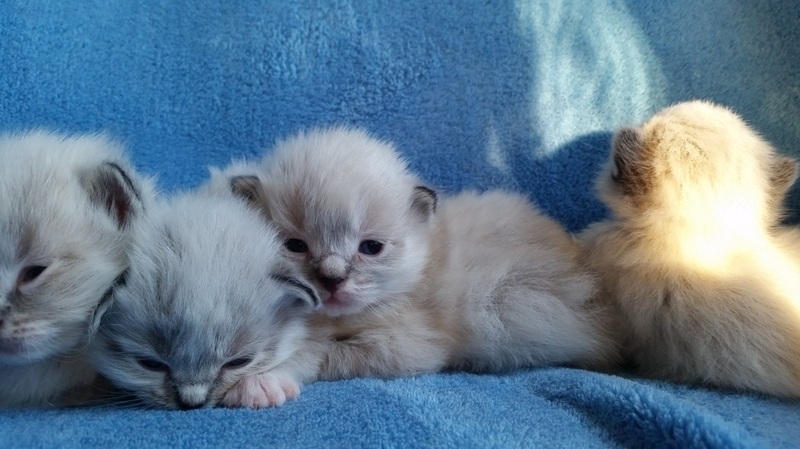 Sophie's kittens Aug '15 - Daisley Siberians Welcome to the kitten site! 12/1/15 Caskoye now nicknamed Cakes waits for her new home and practices socializing. This big handsome boy is going to live with Jan M in Salem Oregon. She also owns his full sibling from a previous year. This kitten is full of attitude. As a younger kitten he was “vocal” and rather demanding. He always has been a real character with a spicy personality. I think on the inside he is really just kind of a spoiled mama’s boy. 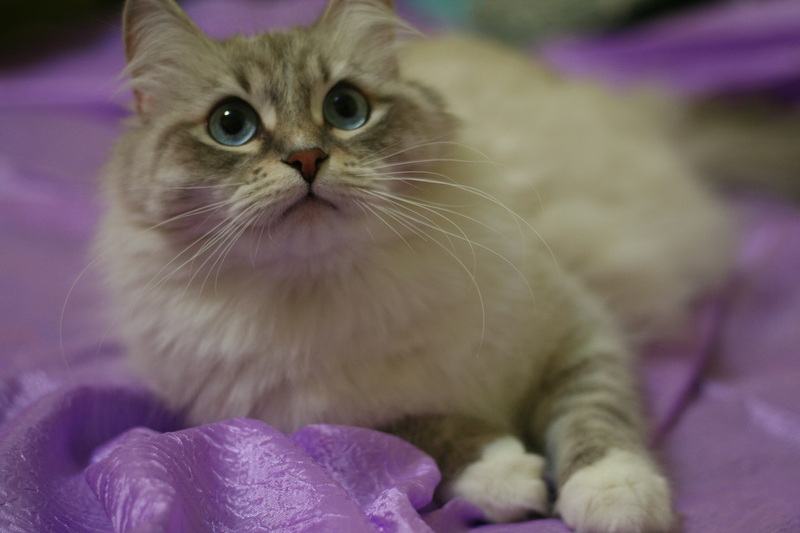 Now at the weaning stage he is almost the largest kitten and is very beautiful and fluffy. This cat has the looks of a show cat. This fun, bouncy happy-go-lucky male is large and cuddly. He is docile and relaxed when being picked up and held. He sometimes feels like a big limp noodle in my arms. He is athletic and yet quiet. He has inner peace and is generally content. He loves climbing the cat tree with his big brother. He comes when called and loves food. I expect him to be a big lover boy. He is even-tempered and sweet like his wonderful father, Tam. Smaller, odd-looking kitten with short fur. This cute spunky boy has a strange appearance and a big heart. He has big expressive eyes and uses a lot of eye contact. In the morning when I wake them up he prefers playing over eating his breakfast. He runs around with his slim tail and skinny legs.. I find him the most comical baby I have seen in a long time. I laugh when I watch him stride around the house. 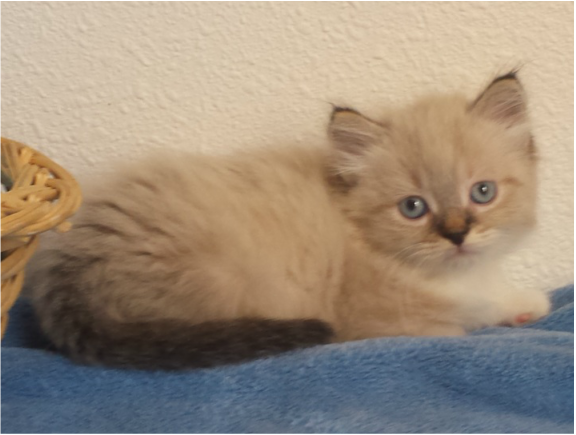 He may end up with a short easy-care coat and mature under 11 pounds. This kitten is a one-of-a-kind. Petite princess female. This little girl has had to deal with four brothers so she likes to be passive and stay out of their way. Once she goes to her new home I’m sure she will thrive being the center of attention. Her coat is also slightly shorter than the large males. Her personality is delicate and sweet. She will be pretty like her mother, Sophie. 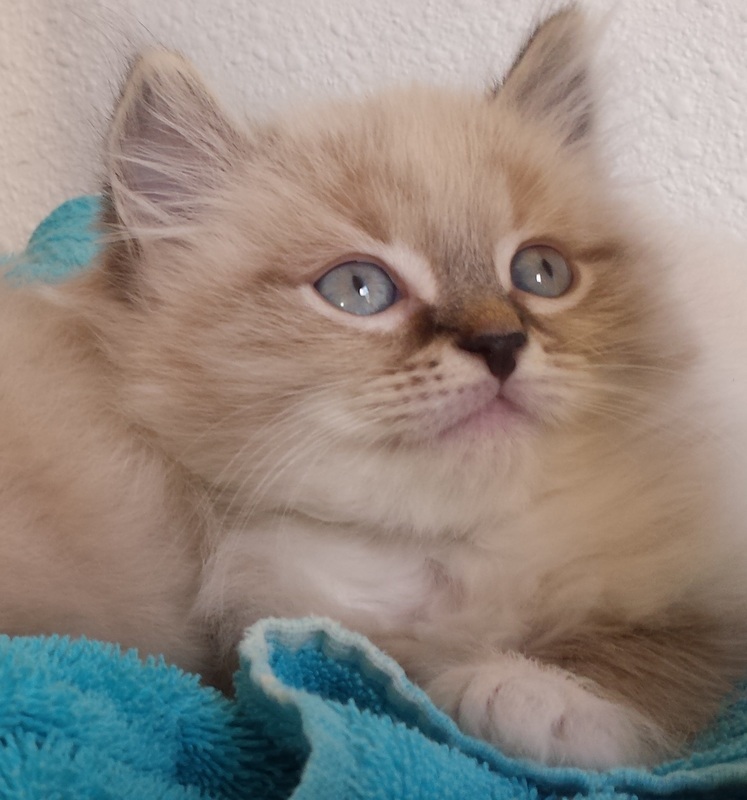 Petite mellow male. 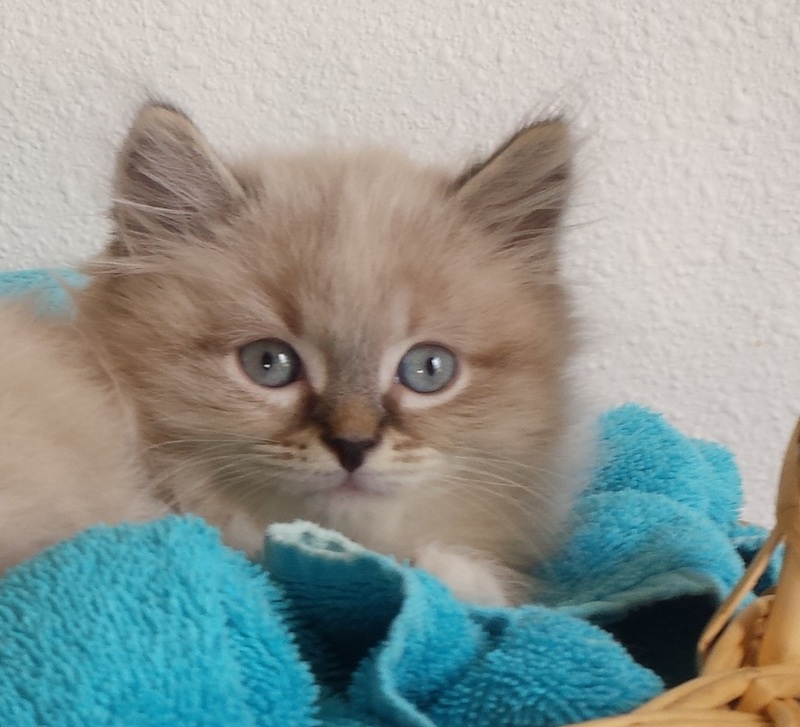 This kitten appears to need more time to mature before he is ready to go to his new home. He seeks out human attention and is super sweet. He seems to have a very strong bond with his mother and is taking the weaning process very hard. I am feeding him special high calorie meals twice per day. This guy loves to hide in my laundry baskets and sit on my shoulder. He is going to be a wonderful companion. The kittens are starting to show personalities although they are still nursing a lot. New photos will be coming soon and some videos too. Names will be posted in a few days. This is the "C" litter. Although you can change their names in your home they will have a Russian name starting with this letter. One male is available to someone on the reservation list. All kittens have white socks, mittens or toes. Although it is too early to say for certain.. they might all be lynx points. The black noses indicate that they will not be light grey like mama Sophie. They might all be seal tabby lynx points with white feet. The four boys are very similar in size and weigh between 10 and 11 ounces. They can see, their eyes are open but they are still settled happily in the nest box and nurse all day long. They are sleeping and eating and growing. When they try to walk.. it looks like a wobble. Watch this space for big advances in the next few weeks. Welcome to the Sophie litter blog! Well, my goodness.. they are so cute!!! Photo update today Friday Sep 18th. (18 days old) I interrupted their nap to take photos. 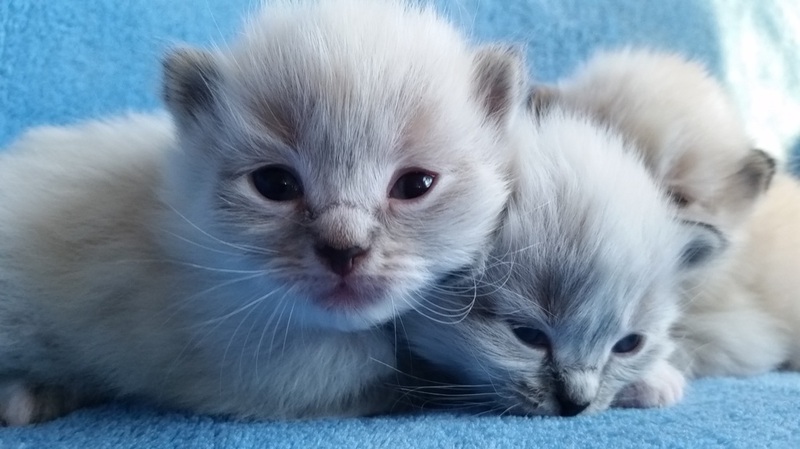 Their eyes are a little goofy and their eyes don't focus well yet as they spend 80 percent of their time napping or nursing. These fuzzy and chubby babies are still in the nursing box all of the time. Aunt Ballana is nursing them alongside with Mama Sophie so there is lot's to eat. It is exciting that there are a lot of WHITE MITTENS! .. maybe they were all blessed with this adorable marking? Over the next two weeks they will start walking more and venturing out into the living room to sit on my lap. I try to keep their lives very simple and full of comfort for the first month. Names coming soon.. and some videos. The four males will be available to those on the reservation list. 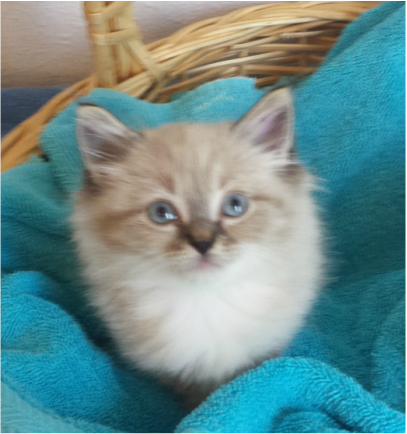 In the next month or 5 weeks we will see who is a lynx point like mama and who is a seal point like Dad. Some will have white paws and some won't. This video shows how they 'mew' in a sequence to get Sophie's attention, rather like baby birds. 3. Male pending to Jan small vocal one..
5. Male available to a person on the reservation list as of 9/25.